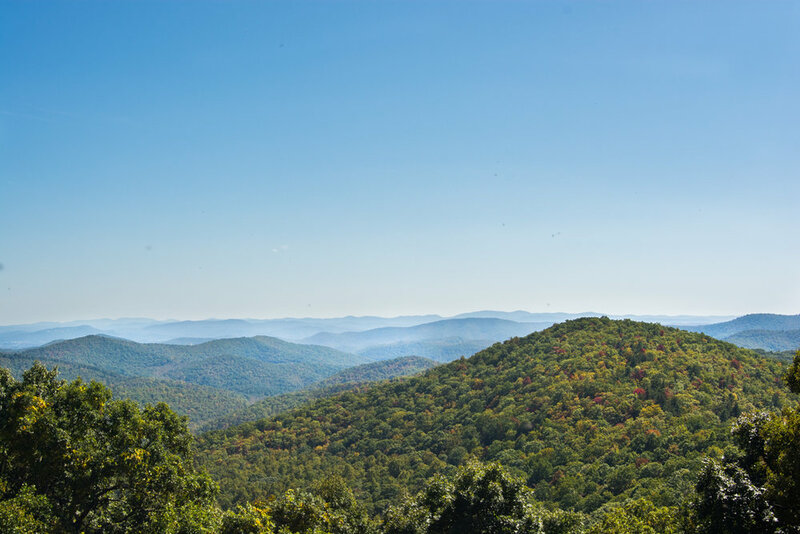 Most people around the world have heard of the Blue Ridge Parkway. If they live in North Carolina, it’s just one of the most beautiful roads they could take to work or to just get away on a picturesque day. The Blue Ridge Parkway way is 469 miles of road connecting the Great Smoky Mountains National Park in North Carolina to the Shenandoah National Park in Virginia (Blue Ridge Parkway Association, Inc.). While we were visiting on our honeymoon we tried to hit as many mileposts that we could in one day. Unfortunately, we couldn’t do as many as we wanted, but we did get to see a handful of wondrous overlooks. Below are the main overlooks we visited, along with some smaller ones that are not noted. We woke nice and early on another beautiful day in North Carolina. What can I say, we couldn’t complain at all during the week. We had flawless weather every day, which made us fall in love with North Carolina even more. Of course I had my cup of coffee and we made breakfast. Eggs and sausage, yum! Just like the other day, Brian and I had some matching shirts to wear on our day of adventure. They both said, “It’s a Batey thing. You wouldn’t understand!” Classic, I know, right? After our tummies were full we headed out to the parkway, of course Rusty came along too. I can’t recall exactly how we got onto it. Brian just remembered seeing a sign saying to take a certain exit for the parkway. Sure enough when we took that exit the road turned off into a more secluded area and next thing we knew, the views were stunning. The first couple stops we made were less interesting overlooks. It was nice to see, but we couldn’t see much because of overgrown trees in the way or there just wasn’t much to see in general. So we drove for a bit and decided here and there where it looked interesting to stop. During our travel we met some very nice and interesting people. We didn’t know at first, but along most of the overlooks (where there’s big parking areas) there are also trails into the mountains you could venture on. Brian and I made a note of that since we saw other people with dogs, that when we come back to North Carolina, that’s where we will take Rusty hiking since we know he’s welcome. I also read later on that on some of the trails striking scenic waterfalls can be found. It was so wonderful to be out in the sunshine enjoying the sights of the ongoing mountains. They seemed to never end and I couldn’t help but think about how I would love to get lost within them. At our one stop a man was sitting on the edge, reading a book, just enjoying the landscape that lay before him. In that moment I felt peace. I knew he was comfortable and happy and that made me feel calm because that’s what nature does to me. At another stop we sat in the grass for a bit and just stared out at the mountains. Seeing all the different colors, from the green, orange, and red leaves on the trees to the blue waves of mountains (hence the name Blue Ridge Parkway). A couple that was driving by yelled out “Congrats!” to us after seeing our “Just Hitched” decal. We yelled back to them with smiles. Even Rusty had the biggest smile on his face, taking in the fresh air and adventure. Who couldn’t resist a picture at that time? Towards the end of our journey on the parkway we found a resting spot to stop at. We used the facilities there and while I was watching Rusty, I ran around with him, getting most of his energy out. And of course being the dog mom that I am, I had to take some pictures of him and his handsomeness. The mountains reaching behind him, it was just a perfect day. What’s funny though? When we pulled into the rest stop we ended up seeing the same “Just Married” car that we were following two days before, which I talked about in my “The Great Smoky Mountains” blog. After our pit stop we visited one more overlook before leaving the winding roads of the Blue Ridge Parkway. As we were leaving we had the windows down and just enjoyed the air flowing through the car. Rusty was passed out in the back from all the fun and new surroundings he encountered and Brian and I just enjoyed watching the mountains fly by. Right before we turned off the road we saw a biker pedaling through a dense area of autumn trees and I couldn’t help but think what a lovely day to be out enjoying it like that. Not only cycling, but I’m sure motorcyclists would be loving the views and breeze right then and there too. Little did we know, our adventure wasn’t completely done for the day. We still had some daylight left and really wanted to see at least one waterfall while we were in North Carolina. We found a set of falls not too far from where we were called Soco Falls, located in Cherokee, NC. We headed there immediately and my goodness the beautiful sights never stop in North Carolina. It was a half hour drive to the falls and just seeing mountain after mountain was stunning. How much they changed within a little bit of a drive, a different angle to see. I’m sure there was a closer waterfall we could have visited, but as I’ve said in my previous blog, we kind of forgot to do some planning before we came. Noted once again for the next time we visit. We passed numerous gift shops I would have loved to visit, but we were losing daylight and I didn’t want to leave Rusty in the car all alone. Not long after we entered Cherokee we found the parking area for Soco Falls. It had no sign; the only reason we stopped there was because we saw other cars and could hear the water. The path down to the falls was so narrow we wouldn’t have even seen it if the group of people didn’t emerge from it. We had to be careful because passing people, especially with a dog, was impossible and the trail was very rocky. Once we got to the first landing we saw a small waterfall. It was beautiful though. There wasn’t much water, but there was an observing deck and we were standing right at eye level of the waterfall. The autumn leaves turned just enough that it gave us the warm feeling it was truly October. We stood there for a couple minutes, enough for me to capture some photos and to just enjoy the sound of nature, but light was fading fast, so we didn’t continue hiking to find more waterfalls. We decided to save Soco Falls for our next trip. We made our journey back home and snuggled up to a nice warm fire outside, enjoyed some s’mores, and made ourselves a nice dinner while watching the stars. Tomorrow was going to be even more special for me. I can’t wait for you to see! 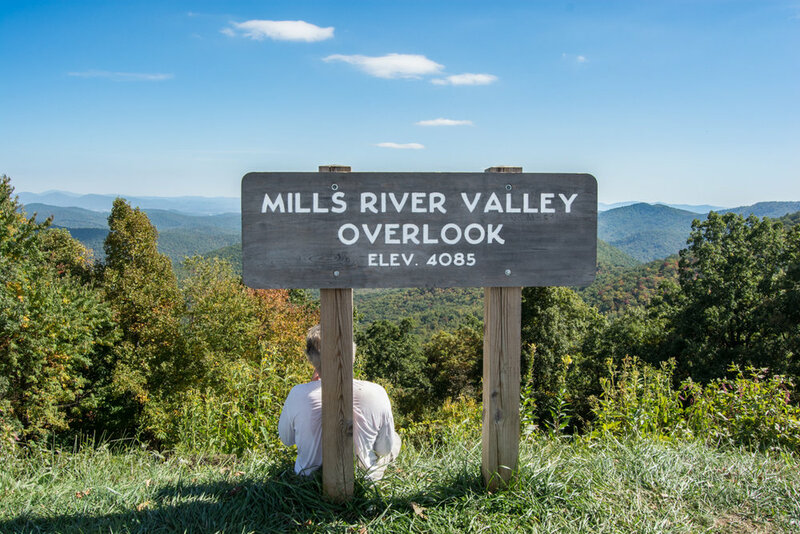 Enjoy these pictures from the parkway and Soco Falls!